I sat down with Patrick Kuczynski, co-founder and Chief Operations Officer (COO) of ShareAlpha, a Montreal-based stock market investing tool that helps DIY investors find new investment ideas in seconds that match their investing style (I previously interviewed him last year on behalf of Fintech publication BankNXT). Patrick and his team recently developed an add-on for Wealthica users; we discussed this collaboration, next steps for ShareAlpha and more. Phil Siarri: Hi Patrick, nice to catch up with you. Can you tell our audience a little bit about your professional experience and what led you to found ShareAlpha? 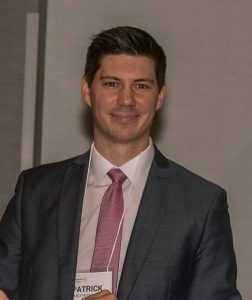 Patrick Kuczynski: My co-founder and I both have years of experience in institutional investing and we met while working together at a Montreal-based asset manager. I’ve taken more of a fundamental approach, working in equity research analyzing companies in great details. My co-founder, on the other hand, has taken more of a quantitative approach by developing quant-based strategies. Combining both our investing styles has resulted in ShareAlpha to offer DIY investors a quant-powered fundamental stock discovery tool. Many beginner investors initially get interested by stocks when they hear how much money a friend of a friend made investing in something, whether it’s cryptocurrencies or blockchain during 2017, cannabis stocks now or something else in the future. We want to make sure that beginner investors know that there are many more interesting options than the current “flavour of the month”. If that is your investing style, then great, but if you want to find other stocks, our platform allows you to find new stock ideas in seconds in the same way a professional investor would. Also, many of our investors simply want to validate their initial stock idea with our proprietary rankings to get a more objective view of a stock. PS: Your team has recently developed an add-on for Wealthica. How did you develop an interest for the platform? PK: We initially reached out to Wealthica for our interest in collaborating with Stockchase, a website that Wealthica acquired. After meeting Simon Boulet, the CEO of Wealthica for the first time, we both noticed that there was a mutual benefit for a potential partnership. Wealthica was working on a developer portal to offer third party add-ons for its platform whereas we believed that Wealthica investors could strongly benefit from our stock discovery tool. The process was quite smooth and we are happy to finally show investors what we have been working on. The add-on that we have developed for Wealthica users basically start with over 10,000 stocks globally, and through our proprietary algorithm, come up with up to 25 stocks that best match their investing style updated each month. We can do this by ranking almost every stock from 1 to 100 in each country based on several factors. Combine several factors together and you have your personalized list of investments. ShareAlpha can be used as much by beginners and up to the more advanced stock pickers. It is very easy to use and saves tremendous amount of time. 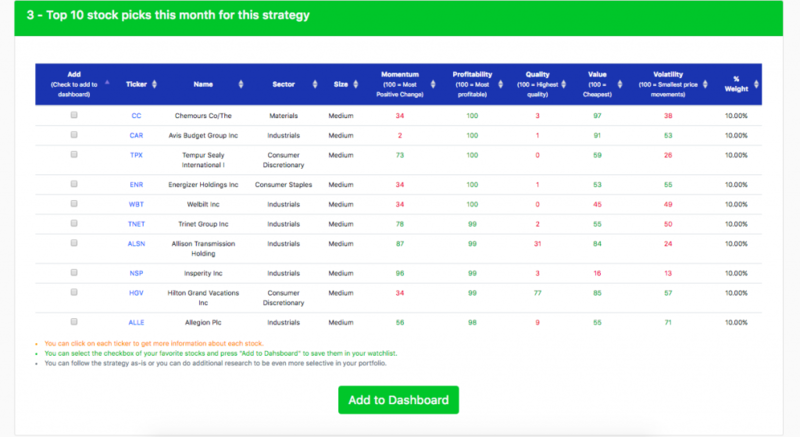 On top of that, we show you the 3-year performance and risk-adjusted metrics of following any of the strategies, so that you can see right away whether your investing style matches your expectations. Many of the strategies have been really amazing, such as a 10-stock strategy inspired by the investing style of Warren Buffet, that not only had a gross return of 127% in 3 years (31.4% annualized) vs. 51% in 3 years (14.8% annualized) for U.S. Russell 3000 index, but at the same time, taking less risk than the index with a smaller downside and similar volatility. PS: How would you describe the collaboration process and your relationship with the Wealthica leadership? PK: We believe that Wealthica is a Montreal success story in the Fintech space. We interacted closely with Simon Boulet and he was very helpful in providing technical advice and general comments to help us improve the ShareAlpha stock discovery tool as well as its messaging. We are very thankful for his contribution to our Company and we hope to continue our team work in the future to further provide value to investors on the Wealthica platform. PS: How often do you expect to introduce new features to help Wealthica users? PK: In addition to our unique screening, we have very recently added a quick company snapshot of each stock with a description, trading/pricing info, financial statement highlights, earnings history vs. analyst expectations, our factor scores and other rankings. 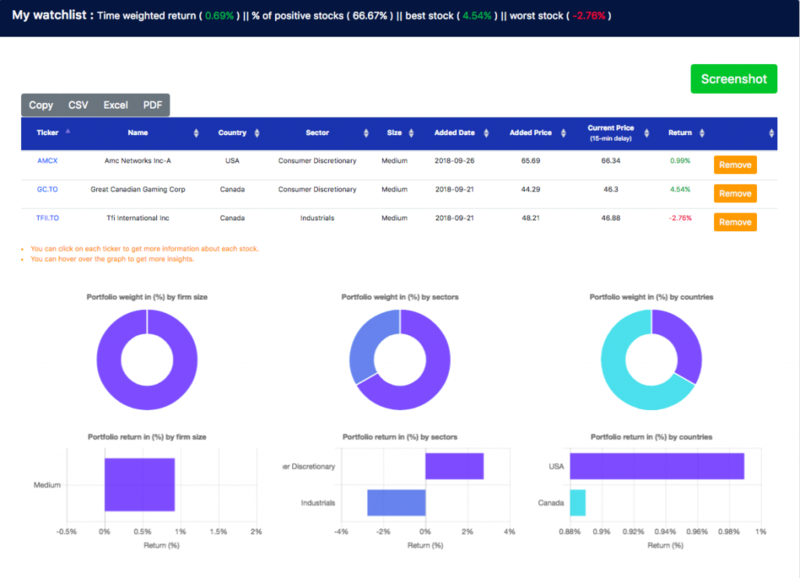 We have also added a dashboard for each investor to build his own watchlist of stocks that he likes from the screeners as well as performance statistics on his entire watchlist. Investors can also quickly see a high-level picture of what others hold in their watchlists to see what are the most popular stocks, company sizes, countries, and sectors. We are currently also looking to more fully integrate with Wealthica by using their API to retrieve users’ holdings automatically to perform more in-depth portfolio analysis. 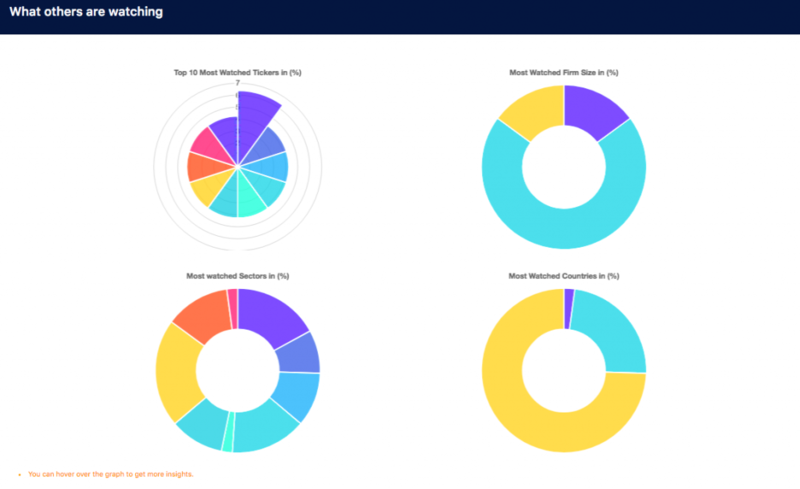 Not only could we show geographic, sector and other traditional portfolio analytics, but also provide each investor a unique view into their portfolio factor exposures to facilitate finding new stock ideas that either match their investing style or for diversification purposes. Our vision is to build a one-stop investing hub for DIY investors, which includes the stock discovery process, due diligence and portfolio management. We are still mostly in the stock discovery phase, but we will focus on expanding the ShareAlpha add-on to include more features inline with our vision. We regularly update our existing tools to make them better and look forward to the feedback of Wealthica users to further improve our platform. We also expect to add new features every few months as we have no shortage of ideas to help investors become better at self-managing their portfolios. PS: What’s next for ShareAlpha in the next 6 to 12 months? PK: As you might recall, the initial idea behind ShareAlpha was to build a marketplace for investment picks’ with performance tracking capabilities for each investor. We initially delayed the idea as we wanted to grow our userbase by providing as much value to investors first. Over the next year or so, we believe we will start to introduce more social features inline with that initial idea such as a leaderboard and the ability for other people to follow people within our community. We believe that there is a lot of investors today that still follow investing tips from random contributors on Facebook or Twitter groups. Individuals without a track record. Through ShareAlpha, you will be able to first determine whether this person is reliable and then make your decision whether to trust him or not. We are also looking for additional strategic partners such as investing websites or chatrooms, discount / online securities’ brokers and other Fintechs, to embed our tools on their platform or to use our API, to empower DIY investors to invest more like professionals. You can always reach me at patrick.kuczynski@sharealpha.co for further questions. Wealthica users can install the ShareAlpha add-on free of charge until October 31, 2018 at https://app.wealthica.com/addons/details?id=sharealpha/wealthica-stock-screener-addon.